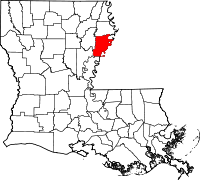 The least populated parish in all of Louisiana with only 5200 residents, approximately, and the one with the fastest rate of population decline, as well, Tensas Parish is primarily a farming area. The parish keeps its vital records with the Court Recorder stationed in the St. Joseph Courthouse on 201 Hancock St. To contact the Recorder directly, call (318) 766-3921. Despite a small influx to its population following Hurricane Katrina, Tensas Parish has continued its decline. The most commonly cited reason for the small population is the lack of well paying jobs in the area. Part of the Tensas River National Wildlife Refuge, an over 64,000 acre refuge, resides in Tensas Parish. The word Tensas derives from the small Taensa tribe of Native Americans who made their homes in the northern areas of Louisiana. During the Civil War, the parish held many active financial supporters of the Confederacy.